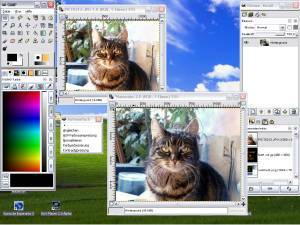 Gimp is the free counterpart to Photoshop. 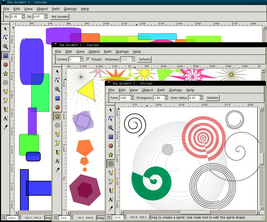 Gimp doesn't handle yet CMYK and 48 bit colors. Blender is the free counterpart to 3DSMax. You can save,play, import and export audio data in many formats: WAV, AIFF et MP3... You can cut, copy and paste (with unlimited undo), combine tacks and add effects to your sound tracks. The software handles special effects: bass amplification, noise removal, Wahwah. It can use VST plugins. “VirtueDesktops” is a virtual desktop manager for Apple’s Mac OS. It offers features, eye candy and configurable options that no other desktop manager on the mac has added yet, and is under active development. It is based upon the work done by Rich Wareham on DesktopManager, which is a lighter, less feature-packed virtual desktop application. Below are some of the key features of VirtueDesktops.